Reverse glass paintings, crocheting, embroidery and personal items. March, 1934 Susan Veronica (Lukens) Keating, born October 6, 1880, died of cancer April 4,1934. 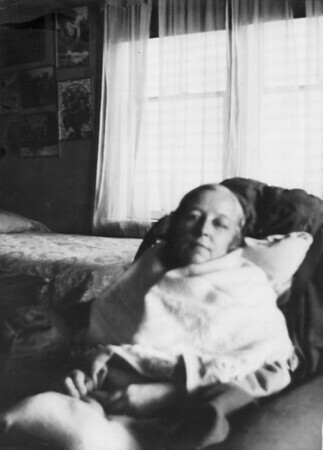 Photo taken in the living room of the Keating house at 523 8th Avenue, Belmar, NJ. According to Veronica Alice (Keating) Golaszewski, the family had moved Susan's bedroom to the living room on the first floor. 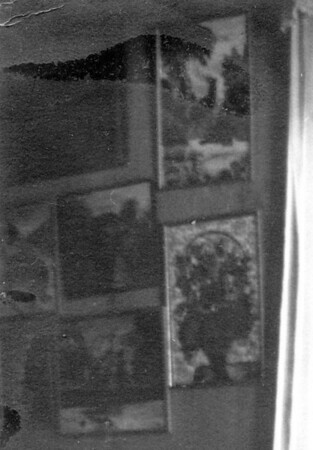 Her paintings are hanging on the wall in the background. Veronica would come home from school (age 9) and her mom would rock her in the chair. Susan died a week after this photo was taken, just 2 days after Veronica's 10th birthday. March, 1934 I recently dismantled the professionally framed photograph of Susan taken the week she died. We only had a "photograph" of the framed photograph. I scanned the actual photo so that we now have a much larger and clearer image, but I also zoomed in on the wall behind her. Thanks to a little Photoshop work we can see some of her other paintings. 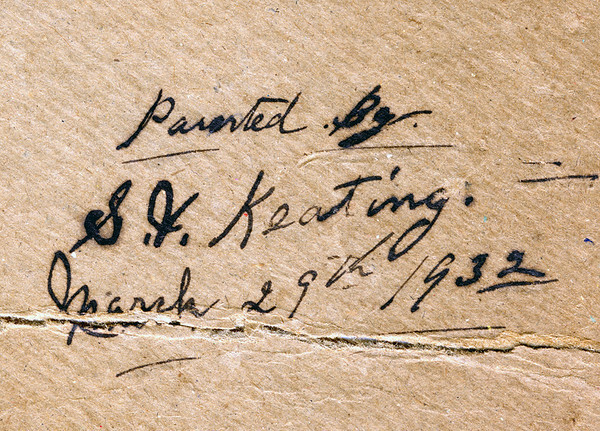 March 29, 1932 Belmar, NJ Inscription on back of Susan V. (Lukens) Keating painting. 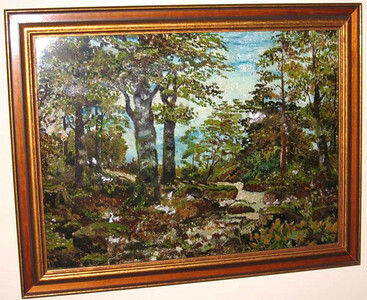 Susan signed the actual paintings with her initials, S.V.K., or SVK. 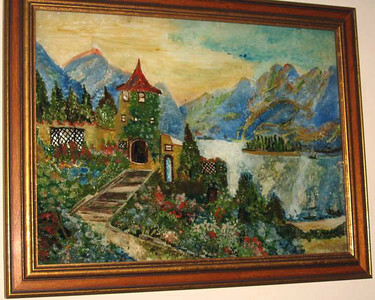 Castle Susan Veronica Keating reverse glass / tinsel painting. Property of Mary Petersack, Port St. Joe, FL. 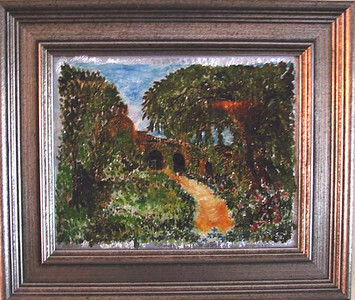 Landscape with Brook Susan Veronica Keating reverse glass / tinsel painting. Property of Mary Petersack, Port St. Joe, FL. Birds Susan Veronica Keating reverse glass / tinsel painting. Property of Mary Petersack, Port St. Joe, FL. 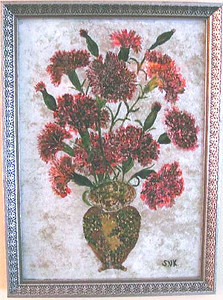 Carnations Susan Veronica Keating reverse glass / tinsel painting. 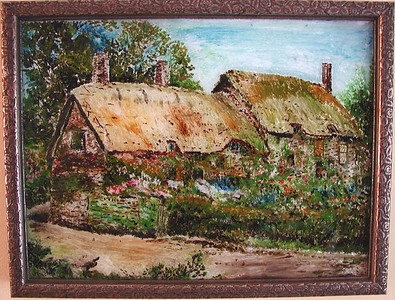 Property of Veronica Szymanski, Chalfont, PA.
Cottage Path Susan Veronica Keating reverse glass / tinsel painting. 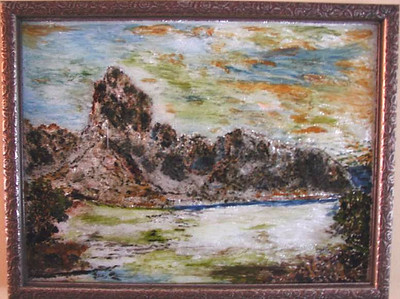 Property of Veronica Szymanski, Chalfont, PA.
Rocky Landscape Susan Veronica Keating reverse glass / tinsel painting. 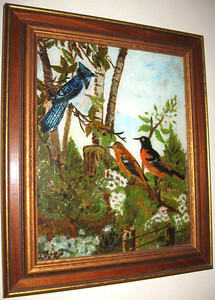 Property of Veronica Szymanski, Chalfont, PA.
Cottage Susan Veronica Keating reverse glass / tinsel painting. 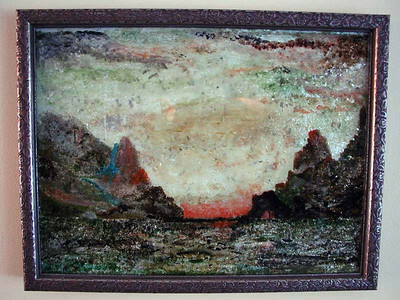 Property of Veronica Szymanski, Chalfont, PA.
Sunset Over Water Susan Veronica Keating reverse glass / tinsel painting. 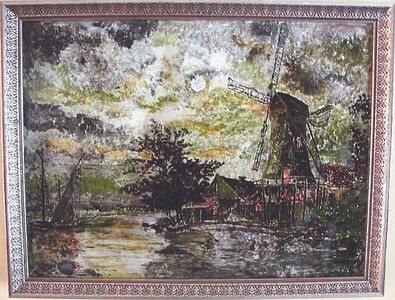 Property of Veronica Szymanski, Chalfont, PA.
Windmill Susan Veronica Keating reverse glass / tinsel painting. Property of Veronica Szymanski, Chalfont, PA. I recently dismantled the professionally framed photograph of Susan taken the week she died. We only had a "photograph" of the framed photograph. I scanned the actual photo so that we now have a much larger and clearer image, but I also zoomed in on the wall behind her. Thanks to a little Photoshop work we can see some of her other paintings.